A new Drake Ullingsworth comic “The Case of the Concrete Collapse”, just published and available for sale via Lulu.com. This is an extensive reworking of a 5-pager from 1984, with the story told from the viewpoint of different characters using full-page illustrations, prose text, comics, and a pseudo TV documentary. 40pp, bw interior, full colour glossy covers, £4.93. 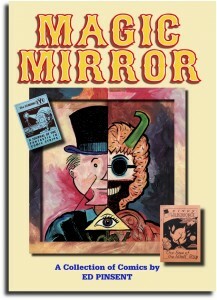 Magic Mirror Book launched today! Eibonvale Books are publishing Magic Mirror, a sumptuous collection of my comic strips as a 350pp paperback (with a hardback edition to follow). It’s all printed A4 size, with a new painted full-colour cover. I made the selection myself, drew a new frontispiece page, and added some extensive notes at the back of the book, about the first time I’ve written at any length about my past work. Half of the book is devoted to Windy Wilberforce and includes The Saga Of The Scroll presented as I would wish, in its entirety and at a size that displays the drawings to their advantage. Plus there’s most of Windy’s early adventures, collected together for the first time. The other half of the book is divided into themed sections (humour, fables, poetry, Astorial stories, dark tales…) and collects some of my favourite stories, including a few written by Denny Derbyshire. The cover is supposed to represent aspects of various characters’ faces, all refracted through the prism of art. Of course I suppose it would only make sense to a reader familiar with all my characters. Watch this space for further details as the book becomes available. Just created a new shop page today. From here you can buy the Windy Wilberforce and Primitif paperbacks. I also have a few unsold Fast Fiction and Staring Eye items. All prices include postage to anywhere in the world.